Microstrip antennas have wide applications for communications in microwave bands. Such antennas are implemented on finite substrates consisting of a single of multiple dielectric layers. While in many applications it is appropriate to approximate such substrates with infinite layers, the finite size of the substrate often makes a substantial impact on both radiating properties and terminal characteristics of such antennas. Wave3D tool handles analysis of such antennas with ease due to effective broadband MLFMA acceleration. Fig. 2a: Magnitude of current (top left), time snapshot at t=0 [s] of vector current density on radiating element and ground plane (top right) for a microstrip antenna implemented on finite substrate at 10GHz. The bottom left subfigure depicts vector distribution of electric field magnitude in a near-field slice as well as vectors of the electric field in the substrate. The bottom right subfigure shows near field slice of the magnetic field distribution and the magnitude of the electric field in the dielectric layer of the substrate. Fig. 2b: Wave3D calculated frequency sweep of S11 parameter of the microstrip antenna on finite substrate excited by via port against S-parameters generated by a commercial planar solver for the same antenna on infinite substrate excited by the microstrip port. The differences in calculated return loss are due to difference in excitation mechanisms (microstrip port in planar solver vs. via port in Wave3D) and finite size of the substrate. 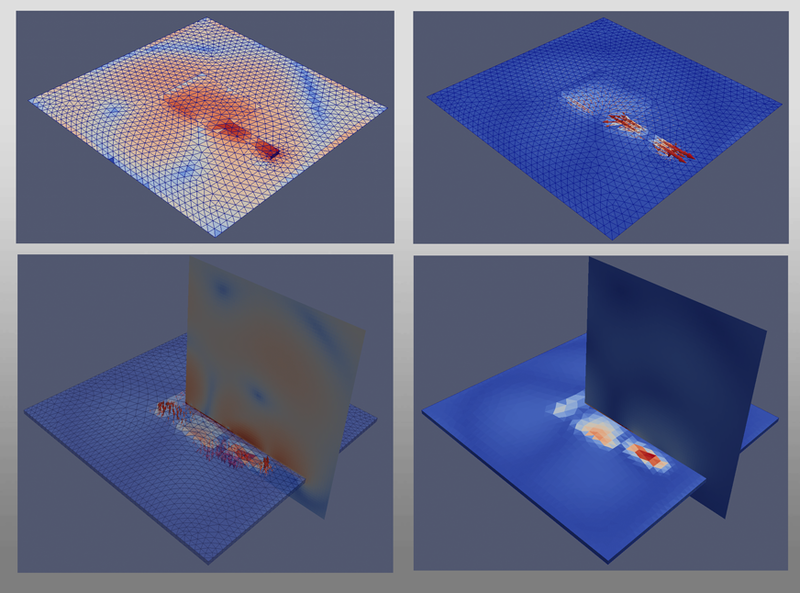 Parametrized analysis available in Wave3D allows for optimization of the microstrip antenna designs. Below we demonstrate how the above microstrip antenna design is optimized for operation at 8GHz frequency with the objective of minimizing the return loss. First, a coarse sweep over antenna width and height is performed (Fig. 2c). Fig. 2c: Designs of line-fed microstrip antenna parametrized over length a and width b of its radiating element. Left and right subfigures correspond to the corners of the design variable space while the center subfigure depict optimal design for minimum return loss at 8GHz. The sweep of input admittance Y11 of the antenna over the design parameter space is shown in Fig. 2d below. Fig. 2d: Real and imaginary parts of input admittance Y11 over the range of optimization parameters a and b. The resonant lengths a and widths b at which the input admittance Y11 has purely real values constitute the designs at which the return loss S11 is minimal as shown in Fig. 2e below. Fig. 2e: Magnitude and phase of the return loss S11 over the space of design parameters a and b. From the values a and b at which ImY11=0 one can select an optimal set upon another criteria such, for example, as radiating properties of the antenna. To simplify this demonstration though we select width b=8 mm and further fine tune the design by performing a small step sweep only over patch length a and frequency in the near vicinity of target 8 GHz value as shown in Fig. 2f. Fig. 2f: Frequency sweep of real and imaginary parts of the input admittance Y11 (left and center) as well as S11 parameter (right) in the vicinity of target 8 GHz frequency for different length of patch a in the vicinity of its optimal value. Width b is fixed at 8 mm. From Fig. 2f we observe that the Y11 admittance has the smallest imaginary part at 8 GHz when a=11.5 mm. If the accuracy of obtained resonant frequency of 8.02 GHz at a=11.5 mm and b= 8mm is sufficient for the application purposes, the design terminates. Otherwise, a fine sweep over patch length a can be conducted to further narrow down it’s value producing the resonance at a frequency closer to 8 GHz value. Electromagnetic fields in each of explored design solutions are readily available for the analysis and visualization. Fig. 2g: Magnitude of surface current density and its directions on the three configurations of the antenna depicted in Fig. 2c.